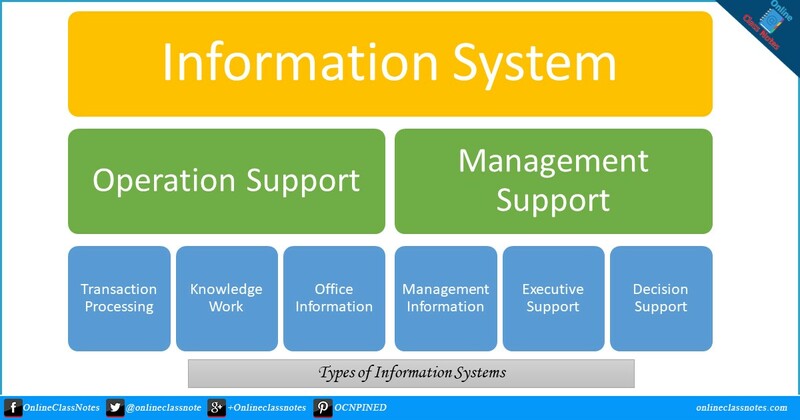 What are the types of information systems? Explain. This type of information systems facilitates daily accounting of an organization. Such as, sales registry systems, POS systems. hotel management systems etc. These systems help an organization to be running successfully. Transaction processing systems are generally an important section of any organization's work flow. If transaction processing system isn't working for an hour or few days, the organization may fall into trouble. Such as, consider a POS. If a super shop is dependent on it's POS and the POS isn't working for an hour, the whole organization will fall into a trouble managing it's sales. The level at which one uses one's thinking and understandings to further understand a topic and take decision is the knowledge level of an organization. Knowledge work systems are made with a purpose to supply required information to those users who need to take decisions. Knowledge work systems generally creates reports and provide stored and processed documents as per requirements to users to further analyze a situation to take decision. Office information systems runs at the lowest level in an organization where users generally do routine works like inserting daily data, processing documents and reports for daily operations etc. These office information system can automate an office with features like office automation. These kind of information systems are generally report based systems which create reports for managers of an organization to better understand the current status of the organization. These systems helps reduce a tons of task of an organization, such as collecting a month long log for each employee working, their salary-attendance-completeness etc. As the reports can again be filtered and sorted to needs, it is very helpful for the managers to understand current status of the organization and to take plans and decisions for future. Information systems used by senior managers are called executive support systems. These information systems takes data from management information systems and decision support system, but along with these, the system takes data from insertion also. Such as, while taking a decision or future planning, the executive support system also presents data like changes business laws for that country or location etc. Executive support systems filters data more to sort out information received from management support systems and decision support systems.